HOUSTON: It was a feat of Herculean proportions, a display in creative eloquence. 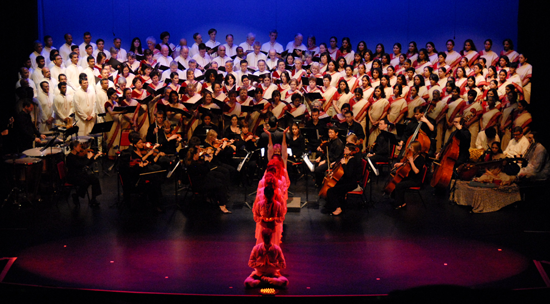 The stage at the Cullen Performance Hall at the University of Houston inundated with a cast of 220 singers, musicians, and dancers, the hall resonating with voices in soul-stirring melody, and capacity audiences moved by the messages of global peace and harmony. Shanti – A Journey of Peace, the brainchild of Cincinnati-based musicologist Maestro Kanniks Kannikeswaran, teamed a coterie of richly enthusiastic vocalists from the local Indo American community with the United Nations Association International Choir (UNAIC) in a unique multi-culturally diverse and interfaith endeavor. 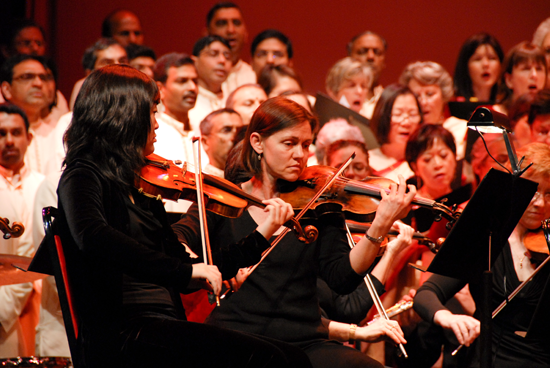 Serving as choral and orchestral conductor to Kannikeswaran's opus was Eric Esparza, Interim Conductor of the UNAIC. Two presentations of Shanti on March 13, 2010, at 5.00pm and 8.30pm respectively, drew capacity audiences and raised over $227,500 in ticket sales and donations for the visionary philanthropic organization, All India Movement for Seva (AIM for Seva). The programs began with welcome addresses by Mistresses of Ceremonies for the evening, Bhavani Iyer and Rohini Chandrashekar, who also acknowledged the presence of dignitaries in the audiences. They included Consul General of India Hon. Sanjiv Arora, Mayor of Pearland Tom Reid, spiritual heads of diverse faith – based ministries, and leaders of local social, educational, and community organizations. Projected onto large screens flanking the stage were video presentations of humanitarian work being done in India by AIM for Seva. 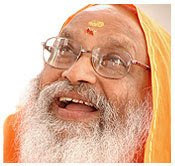 The movement founded and spearheaded by His Holiness Swami Dayananda Saraswati in the early 2000's, touches the lives of over 2.5 million people in 1,000 rural and tribal villages across 15 states in India. AIM for Seva is a movement that Shanti's creator Kannikeswaran resolutely believes in. He made several trips over the past 18 months to this city volunteering his creativity and time for the worthy cause. The performers, many with fulltime jobs, were so inspired and energized by Kannikeswaran's commitment to the project that they dedicated thousands of hours in preparation for the stage show. Shanti is a monumental representation of 5,000 years of India's living traditions through music and dance. It reiterates India's spirit of inclusiveness that allowed a plethora of faiths to co-exist harmoniously for centuries. The presentation celebrates the human mind when it transcends differences and diversity and empowers itself to see goodness and likeness in all beings. A master craftsman conversant in the classical western and Indian forms of music, Kannikeswaran has built Shanti on that tensile fabric with multi-textured hues of harmonizing in tandem. Rather than a Broadway presentation that transports participants from city to city, Shanti incorporates local talent pertinent to the city of performance. The objective of AIM for Seva is to make education possible to every child in inaccessible and rural areas through the concept of chatralayas, or student homes. Student homes are located near existing schools and each student is provided with clean living quarters, food, health check ups, books, vocational training, after school activities, all free of cost to help them get ahead in life. The goal is to have at least one home in each of the 600 states. The charitable trust has more than 122 projects that include 83 chatralayas, 20 schools, five hospitals, 17 health care centers, 11 medical clinics including seven mobile units treating about 200,000 patients each year. More than 20,000 hours of volunteer work went into the making of Shanti. The stretch goal locally is to raise $500,000 dollars to educate, and to emotionally and physically care for children in India.